5 Don’t Live with your Cancer- Fight it! 10.1 1. What is pharyngeal cancer? 10.2 What is the rate of survival for pharyngeal cancer? 10.3 How is the staging of Oral Cancer done? Oral cancer, also known as mouth cancer originates anywhere in the mouth or on the surface of the tongue. It may also occur on the lip lining, or in the gums, inside the mouth, in the tonsils, and may sometimes cause inflammation in the salivary glands. Cancer which also persists in the head and neck and is often treated similarly to other head and neck cancers. As per reports of American Society of Clinical Oncology, 48,330 patients in the United States developed oral or pharyngeal cancer in 2016, and close to 9,570 deaths were prophesied. Some research data has revealed that individuals of age 40 or above are at a higher risk of developing oral cancer, and the risk among men is twofold when compared to women. In the initial stages, oral cancer does not exhibit any signs or symptoms, but smokers and alcoholics are at an elevated risk of developing mouth cancer and hence it is advisable for them to undergo regular check-ups with the dentist so that if traces persist, it can be treated timely. If one exhibit the symptoms listed above, it does not imply that he or she has mouth cancer. However, if such symptoms persist, it is mandatory to consult a doctor. Do you know what causes oral cancer? Most types of cancers are a result of faulty genome or mutation in the gene that enables rampant growth of cells, thereby leading to cancer. Also known as squamous cell carcinoma, mouth cancer originates in one part of the mouth (originates in the squamous cells that are found in the lining of the lips and mouth) and eventually invades other parts such as the head and neck, and other adjacent areas. However, the driving force of mutations is yet not fully decoded, but certain other risk factors are linked to increased odds of oral cancer. Smoking has been found to contribute a significant risk of mouth cancer, and tobacco and alcohol are some other notable risk factors for oral cancer. Regular smokers are three times more likely to develop oral cancer when compared to non-smokers. The risk of oral cancer is 30 times higher among individuals who are smokers as well as alcoholics. Individuals exposed to ultraviolet radiations on the lips, either from direct sun rays, sunbeds or sunlamps. Human Papillomavirus (HPV) Infection- It has been found to be the primary culprit of head and neck cancer which comfortably conceals itself in small pockets on the surface of tonsils. Another cohort of study has indicated that non-smokers who have developed oral precancerous lesions are at elevated risk of mouth cancer. As per National Health Service (NHS), UK- fragile or jagged teeth have been associated with elevated risk of mouth cancer. Endoscopy- This procedure involves inserting an endoscope down the patient’s throat to determine the extent of cancer. Biopsy- A patient may be made to undergo biopsy, which includes extracting a small portion of tissue and is then sent to the laboratory for microscopic evaluation. At times brush biopsy is done which involves collecting cells by painlessly brushing them to one side. Imaging tests- X-ray, Computed Tomography (CT) scans, and Magnetic Resonance Imaging (MRI) are few imaging tests which patients are made to undergo. 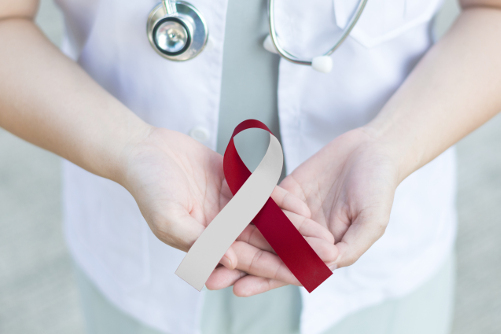 If an individual has been diagnosed with mouth cancer, then next step is stage determination. Various lifestyle factors listed below have been associated with mitigating the odds of mouth cancer. Incorporate a healthy diet and lower intake of fried foods, saturated fats, and processed non-veg food such as red meat. Substantial research has backed link between lowering risk of oral cancer and incorporating a healthy diet comprising of green leafy vegetables, fish, fruits coupled with regular physical activity. Don’t Live with your Cancer- Fight it! Removing cancer via surgery involves removal of tumour along with a portion of healthy tissue surrounding it. Non-malignant tumours may demand small-scale surgery, but widespread surgical tumours require removal of the tongue or the jawbone. If cancer invades the lymph nodes in the neck, surrounding tissues in the neck along with the lymph nodes will be removed. Every surgery comes with a risk. If there are any modifications of the face, or the patient’s ability to talk, eat, or both, reconstructive surgery becomes inevitable, which further involves transplanting skin grafts, muscle, or bone from other parts of the body. Dental implants might also become necessary. Oral Cancer treatment is deemed to be cost-effective in India. The cost of undergoing surgery for removal of tumour is USD 7000-8000. Radiation therapy costs near about USD 5000, and the cost of chemotherapy per cycle is USD 500. The cost of availing oral cancer treatment in India also depends on various other factors. 1. What is pharyngeal cancer? Pharyngeal cancer is a variety of tumours of the mouth, sinuses, nose or throat. The significant symptoms of such cancer are voice impairment, lumps in throat and difficulty in swallowing. It can be treated either via surgery, radiation or chemotherapy. What is the rate of survival for pharyngeal cancer? An individual diagnosed with stage 1 oral or pharyngeal cancer has 83 percent survival odds, which is more than five years. Of all mouth cancer cases, 31 percent are diagnosed at this stage. Cancers which are widespread, the likelihood of survival is 38 percent, which is more than five years. How is the staging of Oral Cancer done? Stage 1: The size of tumor is not more than 1 inch and hasn’t invaded the adjacent lymph nodes. Stage 2: The tumour grows to 2 inches but is still confined to an area. Stage 3: Size of the tumour is more than 2 inches and sometimes spreads to the adjacent lymph nodes on the same side of the neck. Stage 4: The tumour matures and spreads to tissues around the mouth, lips or invades other parts of the body.